The benefits of maintaining the furnace blower and coil are often overlooked. A routine cleaning to the furnace can save homeowners hundreds and even thousands a year on utility bills. Summer time can get a whole lot hotter if your AC is not preforming as it should. If not cleaned, cooling coils will build up a layer of buildup that simply clogs the air and forces the air handler to work harder and longer to reach the desired temp. Needless to say, you will not only feel hotter indoors, you will feel lighter in your pocket for the extra money you will spend on the electric bill. A simple coil cleaning will unclog the airways and improve your AC system. The same goes for the blower. A blower cleaning will remove years of buildup that impair the air pushing capability of the blower, more air, less electricity to cool or heat the home. Blower and coil cleaning will also prolong the life of your heating and air unit and could save thousands of dollars in repairs or HVAC replacement. Because coils are very cold when operating, condensation will cover it, attracting dust to stick to it, forming a coating of wet organic material. The combination of moisture and food source is the perfect breading ground for bacteria and molds to grow and infest the entire air system. The professionals at Duct Pros will remove any mold growth and restore the unit the a safe and functional environment. Clogged coils is a damaging thing. All the air in your heating and air system is passing through the coil, if it happens to be blocked, it will impairing the air flow, causing the HVAC system to work harder or even break down. 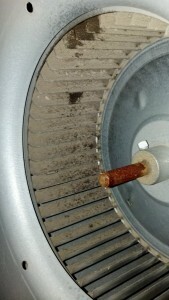 Scheduling for a coil cleaning in Houston TX once a year will prevent such occurrences. Our coil cleaning process is designed to be harmless for the coil and for humans. We use a gentle foam to dissolve and remove any mold, mildew, dust or grime and rinse it with our specialized tools, to leave your coil free of any abstractions. A clean coil will insure the continues, smooth operation of your HVAC system.